Physical space & acoustically effective. Storage elements remain important pieces to create physical space in the office. Yet they are being rediscovered as furniture, giving space acoustically effective character and form. K2 is a sophisticated, modular office pedestal system that creates a calming look, even in combination with different types of cabinets. Visually dominating top panel and continuous upper side panels. K2 offers a clear, minimalist design with high stability. The combination with the KB box and a variety of colours, materials and surfaces upgrade the furniture and offer countless design options. The K2 storage programme consists of lower and upper cabinets with numerous designs that respond to the individual user requirements and can be combined. 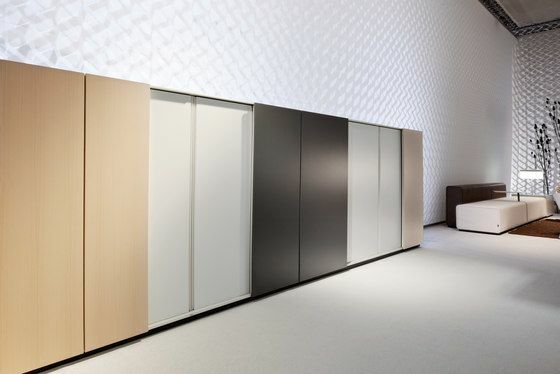 Sliding and suspended door cabinets require no additional space for opening the doors. Vertical tambour cabinets offer convenient access and an overview of the entire width of the cabinet without additional space. Drawer cabinets can be compactly organised, providing an optimal overview and direct access. Hinged-door cabinets offer comfortable access to the entire width of the cabinet.